I've been using PDFTK Server on OSX pre 10.11 for over a year without any issues running commands on the command line. After installing OSX 10.11 beta, I can no longer run any PDFTK Server commands on the command line. It does not throw any error, all the commands I try to execute just hang indefinitely. I've sent in the complaint to Apple via their Feedback Assistant application that gets installed when installing the beta two months ago without a response. You likely won't ever receive a response. Apple only replies through Feedback Assistant for major bugs of the operating system where they need additional information. It is not a way to obtain support, even less so for a third-party application. I've also reached out to PDF Labs, the makers of the package, without response. On MacPorts they're having an issue with the build on OS X 10.11, does this mean that there is a compatibility issue with PDFtk and 10.11 at the software level? I've searched the web for a clue as to what might be causing the issue and how to fix it, but have found nothing tangible. On OS X, I don't know how to go about figuring out if there is now a permission or path or even a Java issue after the upgrade. Any help either trouble shooting the root cause or offering a fix is appreciated. We have been wrestling with this almost as long as the beta has been out. We are still working on it. There appears to be an incompatibility with one of the (non-Apple) libraries that pdftk uses and OS X 10.11. Presently I am installing yet another update to Apple's developer tools with the hope that it will solve the problem. I will update you with our progress. 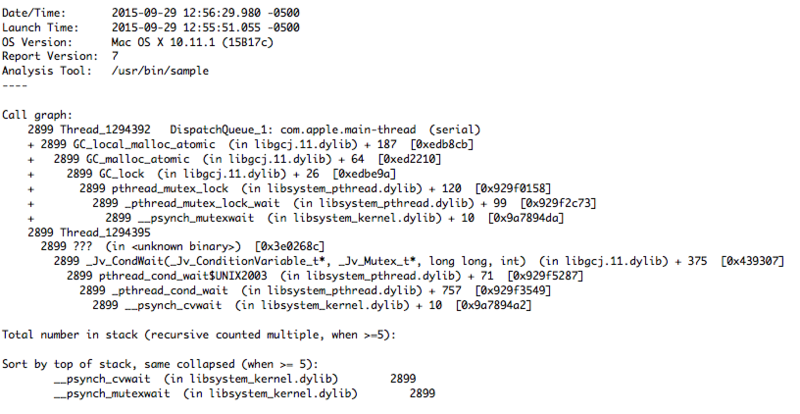 The above snapshot is from trying to run the pdftk binary currently on our site on OS X 10.11. The libgcj library noted above comes with pdftk, where the others are OS X libraries. As I say, I just installed Xcode 7.0.1, which was released yesterday on the App store. I will now attempt to use these tools to build pdftk. This is due to the recompilation of libunwind in 10.11 using Apple Clang 7 producing new valid optimizations (according to Apple) that tickle an unknown bug in FSF boehm-gc. Don't expect any fixes from Apple as they can't touch the GPLv3 code to look at the FSF boehm-gc problem (unless they used the gcc43 package which should still be GPLv2). That this issue is triggered by the recompilation of libunwind is demonstrated by that fact that substituting the libunwind.dylib from 10.10 eliminates both the boehm-gc and gcj failures. Note that is was filed as radr://21372179, "the FSF boehm-gc library built on 10.10 fails to pass its tests on 10.11" but closed as being an FSF boehm-gc bug. The attached Portfile.diff (when used with the proposed gcc5 update on #49227 which fixes gcj) solves the build issue with pdftk. I will proceed to fully test this pdftk before packing it up into an installer. This process could take a couple days. I will update our PDF Labs site soon to reflect this update. If you already have pdftk installed from the old installer, this should install right on top of it without a problem -- it shouldn't be necessary to remove the old pdftk before installing this one. Note that this installer/binary has not yet been tested on older versions of OS X.
I want to thank Aaron for opening this thread and for bringing helpful attention to the problem we were having with the build tools. I also want to thank the MacPorts team for their professional and timely work! Thanks to github.com/quantiverge, pdftk should be installable under brew. This one is tested in OSX Sierra. Run the following in the terminal. Pdftk is currently not working for me on OSX Sierra. docker run --rm -v $(pwd):/files jottr/alpine-pdftk "$@"
remove the old pdftk version; search the pdftk from the finder, move to trash and also have pdftk_uninstall.sh done. Third Edit: The following are not fixes, but rather workarounds, (`cuz sometimes its not feasible to wait months for fixes to arrive). Second Edit: Coherent PDF Command Line Tools (aka cpdf) is free for noncommercial use, and can be licensed for commercial use. It provides functionality comparable to pdtk and (on my MacBook Pro at least) seems to run OK under El Capitan. Edit: This StackOverflow answer tells how to use ghostscript to concatenate files, thus providing (awkwardly) functionality similar to of "pdftk ... cat output out.pdf". For some purposes, the package ghostscript---which ships with LaTeX distributions like texlive---offers similar (but less user-friendly) capability to pdftk. The above worked for me ... your mileage may vary! Needless to say, restoring pdftk to full functionality under El Capitan would be much better ... pdftk really is a terrific utility. These new tools are using the native OSX libraries and no third party dependencies are needed whatsoever. Yay! You can get to a running PDFTK Server under El Capitan if you use the manual of patching ports together with the four patches provided in Macports tickets #48528 and #49227. The compilation of patched GCC5 took a long time on my machine. Also, it seems to be a good idea to name the local ports identically to the original ones (i.e. gcc5 and pdftk), otherwise you have to adjust the Portfiles. It is also possible to bundle the resulting pdftk binary together with its dynamic libraries using install_name_tool on the binary and the dynamic libraries. I succeeded to run pdftk this way on two other machines. Not the answer you're looking for? Browse other questions tagged macos pdf homebrew pdftk osx-elcapitan or ask your own question. How do I completely remove (all versions of) pdftk server from Mac OS X? Why is “PDFtk Server” called “PDFtk Server”?